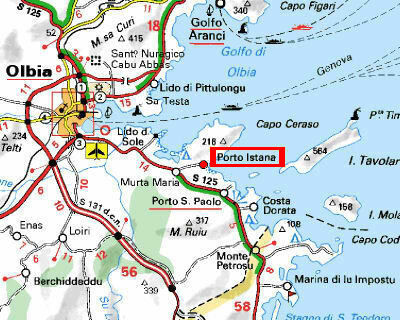 To reach the villa of Porto Istana, you have to take the road of Porto San Paolo starting from Olbia. In Murta Maria, at the roundabout, turn left. After about 1 km, take the small road on your left contiguous to the 1st residential district. Follow the road to the green gate on your right (before the rise), when you reach number 14, reach for the highest part, and there you are! Air sight Sardegna3D.it of beach Porto-Istana .